Perfect for destination weddings, Kate Aspen's Diamond Ring Luggage Tag are fun, useful favors that guests will love. 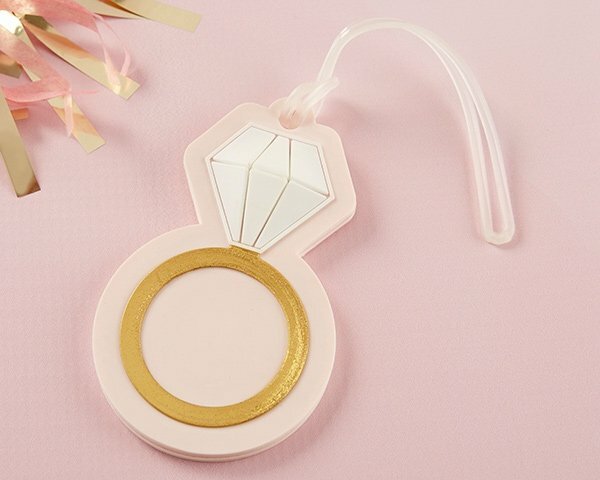 Designed to look like a diamond ring with a gold band on a pink background, each luggage tag is made from durable rubber and includes an area for traveler information. Plus, these favors are easy to attach to luggage, making it easy for wedding guests to stay together while traveling. 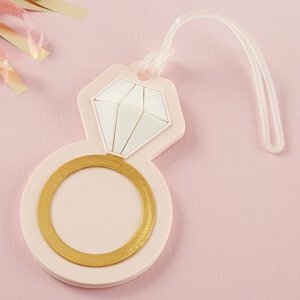 Light pink rubber luggage tag is in the shape of a diamond ring, with white sculpted gem and metallic gold circle. Insert on the back of the luggage tag features a space for a name, address and phone number.